South Street Seaport and the illuminated skyline of southern Manhattan in the background at the blue hour. 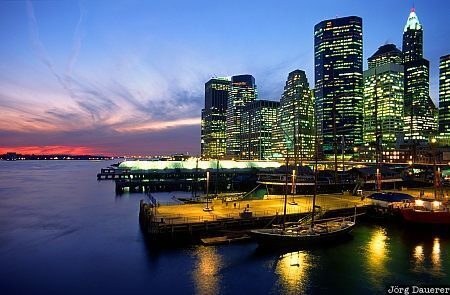 Manhattan is in New York City, New York on the east coast of the United States. This photo was taken in the evening of a sunny day in November of 1997. This photo is part of the exhibition Blue Hour (October 2016). This photo was the image of the month in February of 2016.